In the familiar setting of Holt, Colorado, home to all of Kent Haruf’s fiction, Addie Moore pays an unexpected visit to a neighbor, Louis Waters. Her husband died years ago, as did his wife, and in such a small town they naturally have long been aware of each other, if not exactly friends; in fact, Addie was quite fond of Louis’s wife. His daughter, Holly, lives hours away in Colorado Springs; her son, Gene, even farther away in Grand Junction. What Addie has come to ask—since she and Louis have been living alone for so long in houses now empty of family, and the nights are so terribly lonely—is whether he might be willing to spend them with her, in her bed, so they can have someone to talk with. Louis is surprised, even shocked, that she would’ve thought of him, though he soon is brave enough to try, impressed by the courage of her proposal. And so their lives now find a new rhythm and their conversations range freely, if sometimes haltingly, through their personal histories: his work as a high school English teacher; the loss of her teenage daughter, and the harm this did to her marriage as well as their son; his brief affair, as a young husband and father, which Addie had heard about; their youthful aspirations and middle-age disappointments and compromises; the joy both feel in at last being able to express the woof and weave of their experiences. This unusual arrangement, as Addie predicted, provokes local comment, and then the disapproval of their children, and their nightly pattern is further disrupted when her son, whose wife has departed for California, asks Addie to take in his six-year-old son, Jamie, for the summer while he tries to solve his various troubles. Jamie is confused and hurt, of course, but gradually finds comfort in the company of his grandmother and her friend Louis, neither of whom has spent much time with kids in years but in turn learn how to all over again. Teaching the boy to play catch. Adopting a dog from the local shelter. A camping trip in the mountains, a trip to the county fair, simple pleasures that are a hallmark of Haruf’s fiction. As are the things that jeopardize them, from the death of a mutual friend to family tensions that suddenly test Addie and Louis’s ability to withstand them. And the subtle denouement then sweeps both of these amazing people forward—heartbreakingly, hearteningly into the unknown. 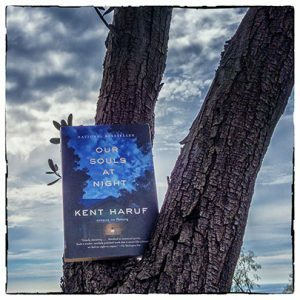 Beautiful, bittersweet and deeply moving, Our Souls at Night is unlike anything I’ve ever read before. The story in itself is pretty straightforward, but if you look beyond what’s obvious, this simple tale is full of little hidden wisdoms. And just like that, Addie and Louis decide to overlook the norms of society and find solace in the company of each other. And gradually night after night as they talk they open up more about their hopes and dreams, regrets and sorrows. But its a small town and people talk, they spread rumors too and so unfolds the story. I won’t reveal any more, and like I said before, the plot is minimalistic but the emotions are overflowing everywhere if you care to look. Its with stories like these that we realize, that elaborate plots and pages upon pages of words are not necessarily needed to tell an emotional and heartwarming tale. This book is less than 200 pages and yet it is impactful enough to leave us readers pondering over the plain truth that life’s simple and irrelevant moments are in fact more relevant than we understand. It might seem like an odd story to some, but for me it was a charming and heartbreaking read. Although, I do wish the ending was different.